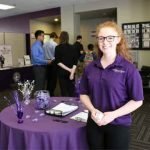 Grand Canyon University is recruiting soon-to-be graduates for full-time positions. Come chat with hiring managers and Human Resources about our many job opportunities. Remember: Dress sharply, bring plenty of resumes and your portfolio!